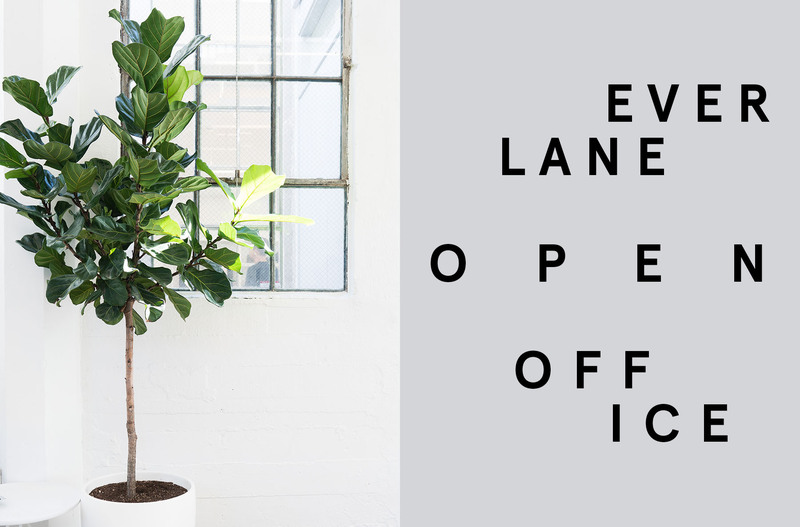 My friends at Everlane launched a series of events last week to celebrate their sparkly new office and showroom. I had the pleasure of leaving cold rainy NY behind to check it out in person. I've been so close to the brand since its beginning days that I am surely biased, but I really love everything they do and the effort they put into their social media channels. If you haven't seen their Snapchat, you're missing out on some good entertainment. And if you're familiar with the brand, you know that transparency is at the forefront of everything they do. Their office and showroom design reflect that openness and transparency. I'm not sure I would get any work done in that space, though, because I would be photographing everything possible in that late afternoon light. Of course it's not just about aesthetics and good window light – there's got to be good substance behind all of that. I know from first hand experience that these folks work hard and have great ideas. I'm always excited and looking forward to seeing what they do next. Below is a little look at the office and showroom, with many gratuitous photos of the window light. Having seen some of the newest pieces in person, I'm particularly into the relaxed poplin shirt in the blue/white stripe. I'm also looking forward to replacing my current modern point shoe, which I've completely worn down already – they're getting a restock of all the sizes that were previously sold out. And if you're like me and have trouble with the length of most shirts (petite problems), the square silk shirt is a great cropped length. They have such a gorgeous office space! I love the open space, and bright feel to everything. I'm totally jealous of the natural light they get! jeans look phenomenal on you! what make are they? Thanks! They're Acne -- it's this style here. Office envy for sure. Those windows are a light-addict's dream! And of course dreamy photos as always. I have gotten one of their tanks before and it's super comfy and soft. A worthy purchase for sure! What an incredible environment to be working in. The huge windows and natural light, high ceilings, ample space... this is what dreams are made of! Albertine (have never been yet but it looks beautiful), McNally Jackson (my favorite), and Rizzoli would keep you busy! Hello, I am Andrew Thompson currently living in CT USA, God has bless me with two kids and a lovely Wife, I promise to share this Testimony because of God favor in my life, 2days ago I was in desperate need of money so I thought of having a loan then I ran into wrong hands who claimed to be loan lender not knowing he was a scam. he collected 1,500.00 USD from me and refuse to email me since then I was confuse, but God came to my rescue, one faithful day I went to church after the service I share idea with a friend and she introduce me to LEXIE LOAN COMPANY, she said she was given 98,000.00 USD by MR LEXIE , THE MANAGING DIRECTOR OF LEXIE LOAN COMPANY. So I collected his email Address , he told me the rules and regulation and I followed, then after processing of the Documents, he gave me my loan of 55,000.00 USD... So if you are interested in a loan you can as well contact him on this Email: lexieloancompany@yahoo.com or text +1(406) 946-0675 thanks, I am sure he will also help you.